UPDATE: I just found out my card was one of the three winners in its challenge. Thanks so much to ODBD and all my followers who are always so supportive. You can see the other two winners here: http://ourdailybreaddesignsblog.blogspot.com/2014/03/anniversary-challenge-4-have-with-odbd.html Have a wonderful, blessed day! Thanks so much for stopping in today. It feels so good to be working on cards again. I've been so busy working on my children's picture book that I've had little time for anything else. I'm done with that now and want to play. So, I made this card for Our Daily Bread Designs' Shining the Light Anniversary Challenge (ODBDSLC195). This challenge here is to use six of something, six of anything on a card. I used six shades of teal/turquoise - my favorite color to work with. I won the cardstock recently from Carta Bella. It's always so much fun to win! This cardstock is from their Hello Again collection. 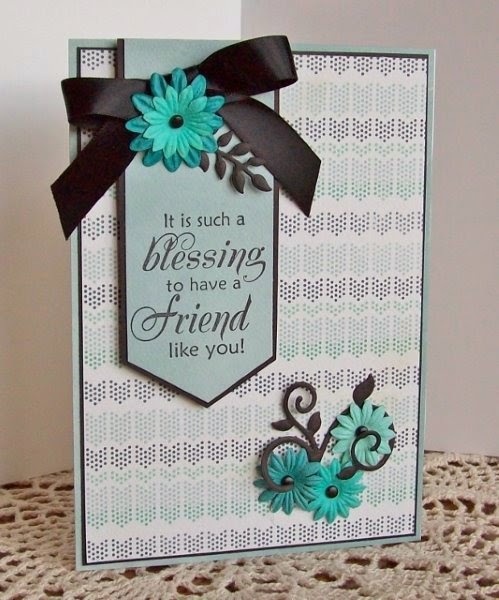 The sentiment stamp is from ODBD's Friendship collection. The leafy branch and the vine are also from ODBD. The vine is bigger than you see here. I tore it - a happy accident because I think it looks better this size on this card. This is absolutely gorgeous Pamela!! I so love turquoise too!! Your use of all the shades is beautiful!! Love the design with the banner and the flowers! Thanks for joining us at ODBD this week!! Oh, Pamela, this is a gorgeous card! I agree with Chris...I just love the colors, especially the turquoise! And the layout is wonderful with the banner and the lovely foliage and flowers! And I see the creative six shades of tea/turquoise...I love it! So glad you've joined us this week for the ODBD Shining the Light challenge! Hugs! Very classy Pamela! Love the teal and brown combo and esp the banner design! Beautifully done! Thanks for creating with us this week at ODBD! Oh, Pamela, I was so excited to see that you won this week's ODBD Shining the Light challenge gift certificate! So delighted for you! Hugs! Pam this is soooo beautiful!!! I'm sorry I'm late getting to see it but wow! Just so pretty with the 6 shades of turquoise and the black really makes everything pop!!! Just love all your details and the tres chic layout!! !